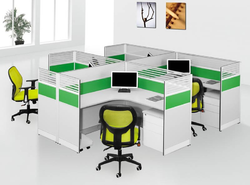 We are a leading Manufacturer of modular workstation furniture from Chennai, India. We are offering a wide variety of office work station that suits the working environment for various companies, industries and various other organizations. Our office work station are fabricated from best quality wood that provides long service life. The skilled artisans and designers in our firm plan the office work station with various aesthetic designs and sizes with perfect finishing.